ALSIP co-design workshop outcomes have been published and are being used to inform the detailed program design and economic modelling. The report can be read here. Feedback, expressions of interest and co-investment commitments can be provided through the downloaded Feedback Form. Support and co-investment is being sought to create a nationally funded program to deliver spatial innovations through the red meat value chains across Australia and internationally. The Australian Livestock Spatial Innovation Program (ALSIP) is designed to meet the strategic objectives of the Australian Red Meat industry and contribute to the National Innovation and Science Agenda by delivering industry led research, technology and innovation through the commercial red meat value chains. This program will deliver real world outcomes to improve the value of existing red meat products, decrease the costs required to produce these products, and increase production volume across the value chain. By directly aligning spatial technologies with the strategic investment imperatives set through the Meat Industry Strategic Plan (MISP), investment in this program has the potential to deliver a 3.5 benefit cost ratio with a total benefit of over $140 million by 2021. In addition, investing in spatial innovation which improves adoption of quality and grading standards will deliver an additional $40 million of benefit along the value chain for each 1% increase in the adoption of MSA grading from the current Australian herd rate of 35%. Over and above these benefits, integration of spatial information and technology in to the decision making process is estimated to deliver up to a further 15% of productivity gains for producers. This prospectus will guide co-investment in an industry-led Research, Development and Extension Program in spatial science and location-based technologies across the red meat (beef cattle, sheep and goat) industries in Australia and into export markets. Coordinated spatial technology research across the country that increases the return on investment and develops powerful industry partnerships. 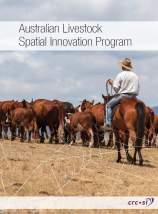 The Australian Livestock Spatial Innovation Program (ALSIP) is seeking co-investment from livestock industry and research partners to support a bid to the federal government to fund a five-to-seven-year program. Partners will have the first opportunity to access the benefits of the technology and services delivered through this program, as well as the potential to build these in to new products and services. A copy of the prospectus can be downloaded here. Feedback, expressions of interest and co-investment commitments can be completed on the Feedback Form here. To stay in touch and learn more about this innovative red meat program, please sign-up for news here.